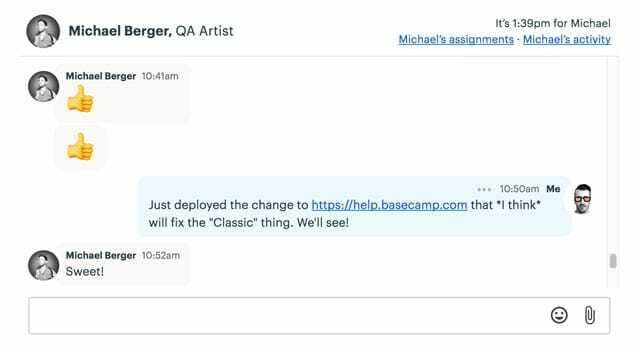 What’s new in Basecamp 3? Just about everything and then some! 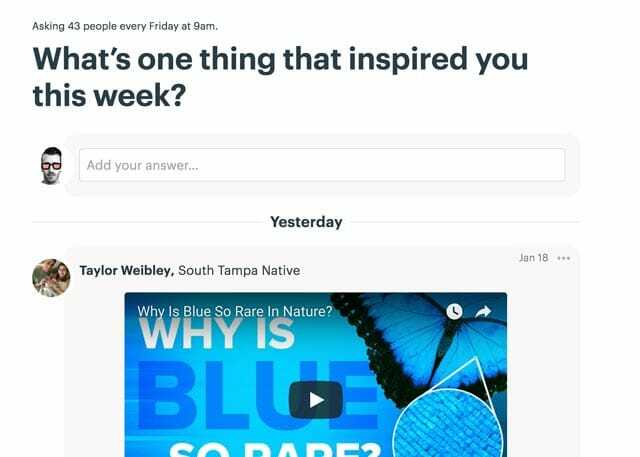 We’ve taken our best ideas, layered in years of customer insights and feedback, and put together the best version of Basecamp we’ve ever made. Unlimited for everyone: No limits! Heck yeah! For 12+ years, Basecamp limited the number of projects you could create based on your plan. Maybe you had the 10 project plan, or the 40 project plan. The only way to get unlimited was to reach deep in your pockets and upgrade to the highest plan. No longer! Now every plan is unlimited! The Hey! menu is a single inbox for every Basecamp notification. @mentions, new messages, to-do assignments and completions all show up nice, neat, organized, and threaded in the Hey! menu. 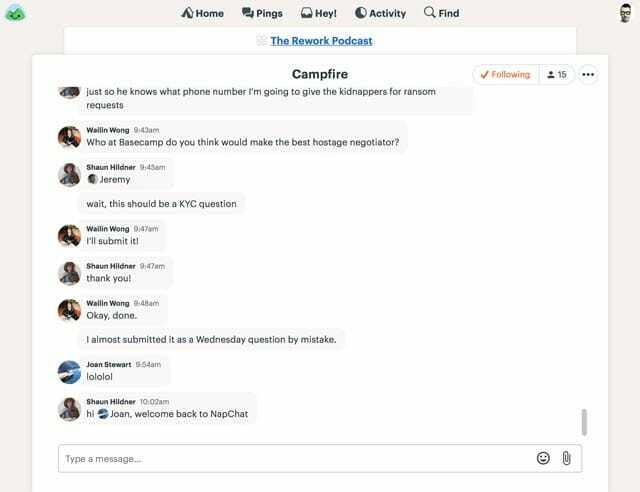 When you need to hash stuff out quickly without a lot of fuss, gather around the Campfire - a group chat at the center of every Basecamp. Perfect for casual conversations, quick Q&As, link sharing, and fast riffs. Pings are like instant messages or direct messages. Want to get someone’s take on something before sharing it with everyone else? Just ping them! Now you can assign to-dos to multiple people. Plus, in addition to setting a due date on a to-do, you can now set a date range. Detail an entire phase of work, be clearer about how long a chunk of work will take, etc. Designed to keep all the milestones, deadlines, and stuff with dates neatly organized and tidy. 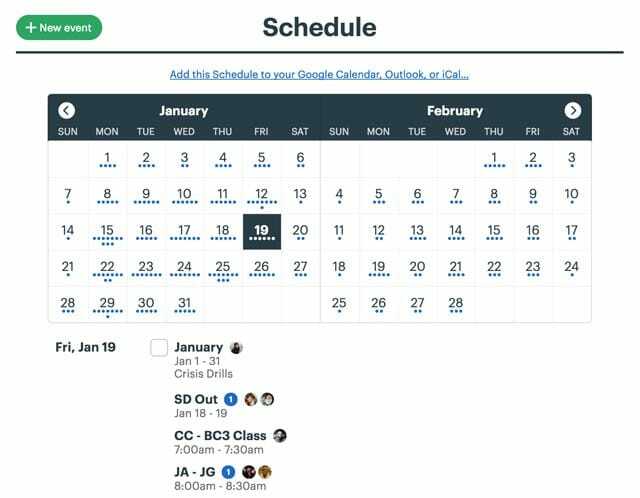 You can discuss anything right on the schedule or add any event to your own personal Google, iCal, or Outlook calendar. Now you can forward any email into Basecamp, discuss it with your team, then reply back to the original sender. Now you can “show me all Jonas’s comments in the Mobile project” or “Show me every image uploaded by Ann”. Sometimes you know who but not what. Other times you know the what, but not the who. And other times you know what it looks like but you can’t describe it. 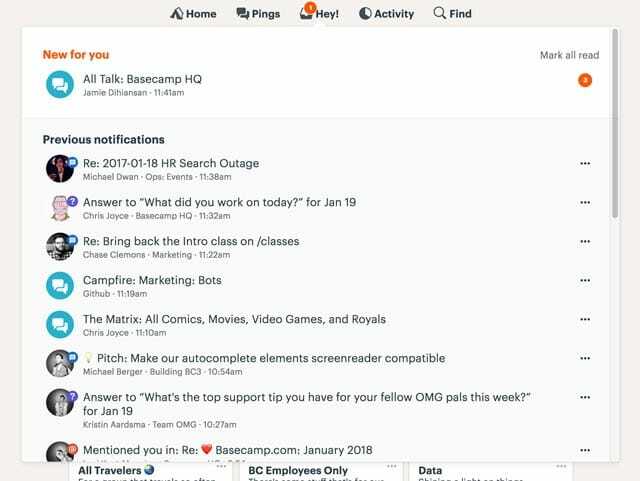 Basecamp will find it. Boosts: Give people a standing-o! Show someone you care by giving them a Boost. They’ll get a discreet notification letting them know you appreciated what they said. 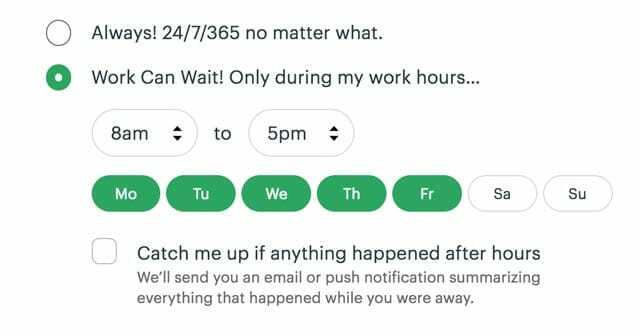 Basecamp 3’s notifications system was designed to catch you where you are without leaving a mess everywhere else. For example, if you’re in Basecamp 3 in your browser, you’ll get a desktop notification. If you’re not in the desktop app, we’ll notify you on your phone. And if you don’t have a mobile app installed (or push notifications are turned off), we’ll send an email. Basecamp 3 lets you share anything with anyone - even if they’re on the outside. It’s great for selectively sharing something with someone who’s not core to your team but who’s interested in something from time to time. Need to get someone’s attention? Want to reference someone in a discussion? Just @mention them. They’ll instantly get a notification letting them know, along with a link to exactly where you mentioned them. 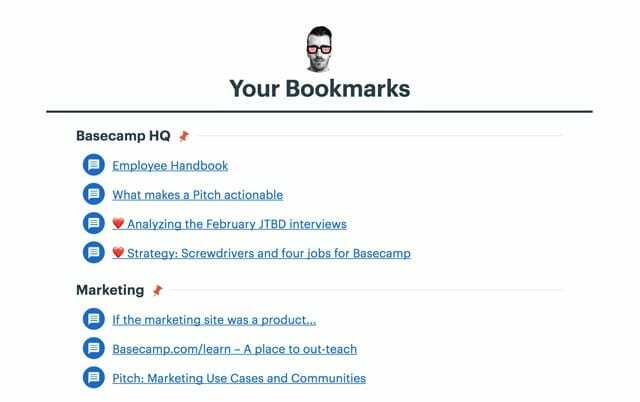 If you bounce between a to-do list and a document often, just bookmark them both in Basecamp and you’ll always be a single click away no matter where you are. Works across platforms, browsers, mobile apps, etc. 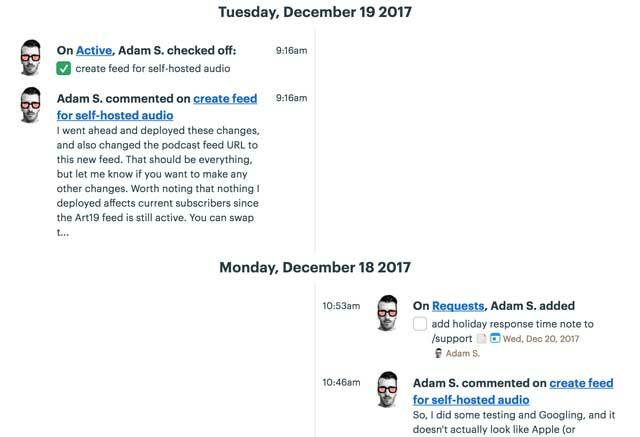 At the bottom of every Basecamp is a timeline of activity going back to the moment you started the project. If you’re looking for something someone did, but you can’t remember where they did it, just scroll down! 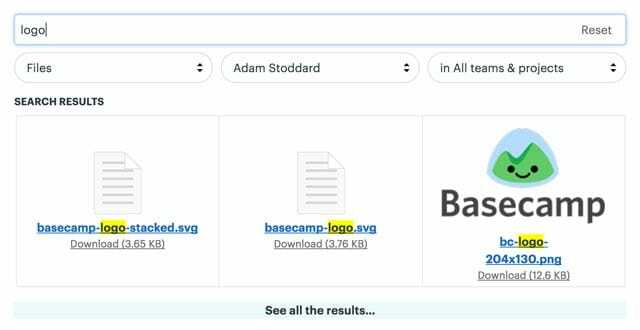 Basecamp 3 lets you organize any file or document into folders (and folders inside folders). What’s extra special is that you can organize cloud-based files as well. So you can make a folder and put a photoshop file, a Google doc, and a PDF together in the same folder! We spent a full year writing a brand new text editor from scratch. Consistent from desktop to mobile, writing finally just works! 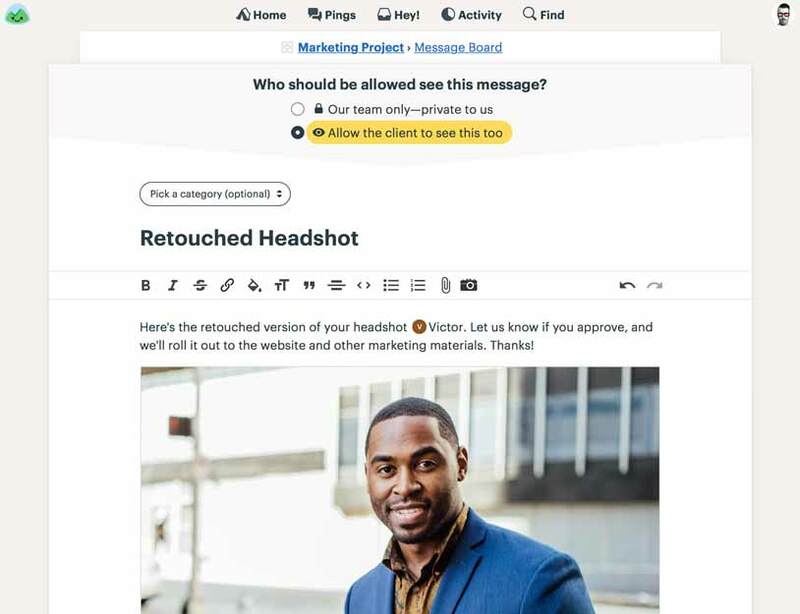 Besides just text, you can drag in images right from your computer, snap a pic with your camera, and even paste images or files right in from your clipboard. Basecamp 3 launches with amazing apps for iOS and Android. Timely push notifications, quick responses, snap a pic of the whiteboard and pop it right into Basecamp for reference, etc. It’s fast and modern. You’ll love it. Color code any file or document (including Google Docs) to make it easier to highlight and locate key files. Go on, turn that super important spreadsheet green, or that document legal-pad yellow! Save new messages or documents as drafts before you publish them. Share drafts with anyone else you’re working with before you publish it. Proofread comfortably, confidently, and privately before you make it official. See all the work you’ve assigned to other people on a single screen. Plus, Basecamp will notify you when someone finishes something you assigned.